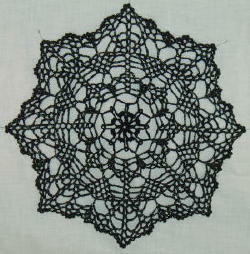 This pattern was one of the Annie's Attic Daily Free Patterns. I didn't quite follow the pattern exactly. 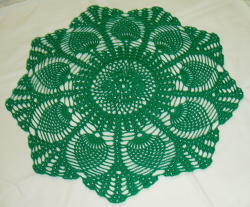 It called for Size 30 thread; I used Size 10.
so I ended up having to increase the chains on most of the rows. 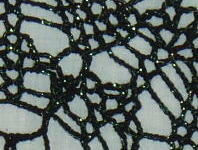 This is an old American Thread pattern. It's hard to see, but I added a shimmery thread because I didn't want plain black. 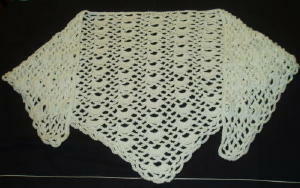 This is my first shawl. so I did a simple chain loop border. 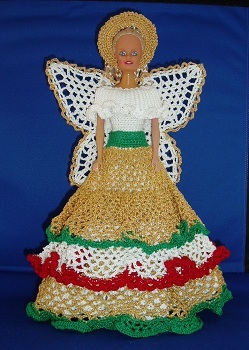 the legs have to be removed from the doll. I used a dollar store doll. 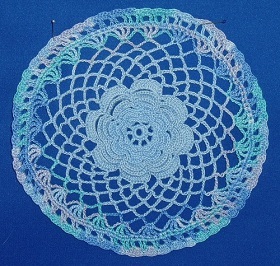 I did not make the whole doily. then added a border to finish it off.